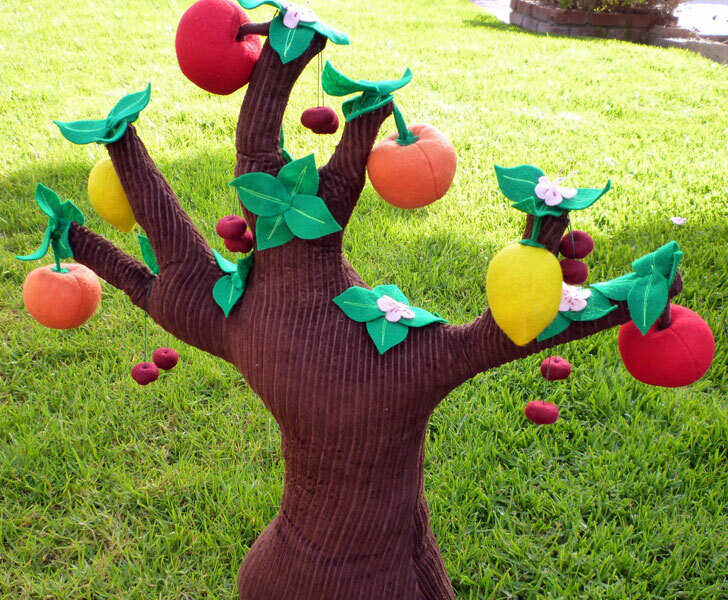 If your child goes mad for felt play food, then this beautiful mixed felt fruit tree is sure to be a massive hit. Maybe one of the most unique, not to mention gorgeous play felt sets we’ve seen, this little tree is handmade to order with 100% corduroy and eco-fi felt. The branches are bendable, due to wire safely encased inside, while a bean bag in the stem gives the tree stability. As a stand alone decor item the fruit is not removable, but still the tree will make a wonderful nursery decor piece or playroom item. Our favorite idea though is a harvest-ready tree! Little Fruits shop owner, Ariane, will attach velcro to the fruits to make them removable and then this tree becomes a great plush toy! Imagine how much fun it would be – your child can pick her own play fruit right off the tree then cook it up in her play kitchen. In total, this tiny tree comes with 2 apples, 2 lemons, 2 oranges, 5 pairs of cherries and 6 cherry blossoms. Awesome fun and the perfect holiday gift! If your child goes mad for felt play food, then this beautiful mixed felt fruit tree is sure to be a massive hit. Maybe one of the most unique, not to mention gorgeous play felt sets we've seen, this little tree is handmade to order with 100% corduroy and eco-fi felt. The branches are bendable, due to wire safely encased inside, while a bean bag in the stem gives the tree stability. As a stand alone decor item the fruit is not removable, but still the tree will make a wonderful nursery decor piece or playroom item. Our favorite idea though is a harvest-ready tree! Little Fruits shop owner, Ariane, will attach velcro to the fruits to make them removable and then this tree becomes a great plush toy! Imagine how much fun it would be - your child can pick her own play fruit right off the tree then cook it up in her play kitchen. In total, this tiny tree comes with 2 apples, 2 lemons, 2 oranges, 5 pairs of cherries and 6 cherry blossoms. Awesome fun and the perfect holiday gift!